Large, brown-to-buff deer with broad hoofs and dark tail tassel. In winter, males grow shaggy throat mane. Newborns woolly with white spots. Males grow unique antler type with foreshaft branching two or three times white hindshaft sweeps back in a simple curve. Large antlers 25 to 36 inches. In Texas, velvet shed in August with antlers dropped in January and February. Further north and east, many stags in hard antler from late April or early May until December or January. Male weight 400 to 500 pounds, but drop 100 pounds of more during rut. Female 300-355 pounds. Do fine all year on grass, but prefer rushes and other aquatic plants in summer. Occasionally eat a few leaves. Relish acorns. Native to marshes and wetlands along rivers. Exotics thrive on grass areas with trees and large ponds or streams available. Wallow in cold weather as well as hot weather. Lounge in water to moderate heat. Quite winter-hardy as long as they have sufficient forage. Use tree for shelter. Generally placid. Generally compatible, but best not pastured with Red Deer or Elk. May to September. 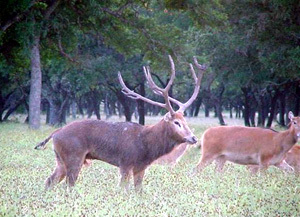 (Texas August to September).Each stag ruts for two weeks during six-week rut period. Keep two to three males with females during rut to competition to insure breeding. Rutting stags very noisy. Male 2 yr; Female 2 yr.
Extinct in wild in native China, however, Pere David Deer are farmed in the United States, allowing this species to continue to exist.